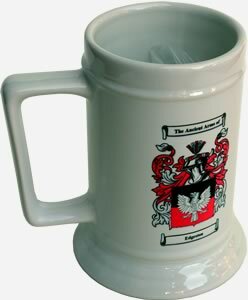 Single Beer Stein with a full color Coat of Arms with Family Crest shown on both sides of this beautiful ceramic item. Each with a Full color Coat of Arms with Family Crest shown on both sides of this beautiful ceramic item. 16 ounce ceramic beer stein with a full color Coat of Arms with Family Crest shown on both sides. Durable; dishwasher and microwafe safe. Pair of 16 ounce ceramic beer steins with full color Coat of Arms with Family Crest shown on both sides. Durable; dishwasher and microwafe safe. 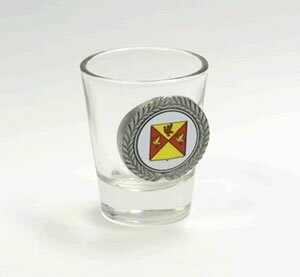 Pewter Accented Shot Glass, 1.5 oz, With your Coat of Arms on the front. This is a great item to accent any bar or china cabinet. Set of 4 Pewter Accented Shot Glasses, 1.5 oz, With your Coat of Arms on the front. This is a great item to accent any bar or china cabinet.